Foreign Minister Kubuabola, distinguished guests, ladies and gentlemen. Nic Nat not only thrills his supporters in Western Australia, but he has become a household name in AFL households across Australia. He is such an exciting player, I think he will be one of the best players of this generation of Australian Rules Football. But he is also an utter gentleman, so much so that the AFL have made him multi-cultural ambassador for the sport and he travels not only across Australia but throughout the region. I understand that not only does he have a significant fan base across Australia, in what is a highly competitive sporting code, he also has a fan base amongst the Naitanui family in Fiji. What that says is that there are so many Fijian Australians who are sports stars in our various football codes. I’d like to suggest that AFL is the most popular sporting code but I’m afraid there will be a few too many rugby league, rugby union people here to suggest this, but we have so many people of Fijian heritage who play in our sports, who are so admired and loved by the Australian people. I believe that reflects the broader affection and warmth the Australian people feel for the people of Fiji and I hope that that warmth and that affection and that love is reciprocated. Australians and Fijians have been friends for a very long time. I read a blog recently by a Papua New Guinean and he was commenting, with more than a touch of envy, that notwithstanding the political differences between Australia and Fiji, notwithstanding the events of 2006 and the subsequent response from Australia, nevertheless Fiji managed to attract record numbers of Australian tourists. He was trying to work out how can that be? How can Fiji attract so many more Australian tourists than PNG? He thought well perhaps it’s because the Australian people have a healthy disregard for whatever their government tells them! But he decided that the reason people flocked to Fiji is because of the warm welcome that the Fijian people give to Australian tourists – the wide smile, the ubiquitous greeting ‘bula’. I’m not sure if he was suggesting that Papua New Guineans were less pleased to see Australian tourists – that certainly hasn’t been my experience – but nevertheless I think there is a valid point to be made, that Australians have been experiencing generous and gracious hospitality of the Fijian people for such a very long time. This morning Foreign Minister Kubuabola made a very powerful speech. He was very candid and said perhaps what a number of people from Fiji have wanted to say for some time. We all know the detail of the events of 2006 and we know the Australian Government’s stance in relation to it but it was refreshing to hear the frustration that the Fijian Government feels about Australia’s approach. There’s no need for me to go into the details again but Foreign Minister Kubuabola speech was a timely reminder that there are very valuable lessons to be learned if we stand in each other’s shoes and we try to see issues from each other’s perspective. It is now time to rebuild the bridges. Should a Coalition Government be elected at some stage this year I commit to ensuring that normalising relations between Australia and Fiji is a priority of an incoming government. I know that there will be challenges. I know that there will be a number of issues for us to address, but with the will and commitment on both sides I believe that we can achieve whatever we set out to achieve. Of course we encourage Fiji to hold elections as Commodore Bainimarama has promised in 2014. We welcome and encourage that commitment. I would like to see, should the Coalition be elected the restoration of full diplomatic relations between Australia and Fiji. I would like to see Fiji welcomed back into the Commonwealth, the Pacific Island Forum and other forums around the world. I’m not pretending that an election can solve all issues – although I have to say that an election in Australia would solve a lot of issues! I’m not pretending that democracy is perfect – believe me, after sitting in the Parliament of Australia for the last three years I’m well aware of its shortcomings – but as Winston Churchill famously observed, ‘democracy is the worst form of government except for every other form’. What I believe we should aim for is to support Fiji in its elections in 2014 and on behalf of the Coalition I pledge our support, in whatever form Fiji requires, to assist them to overcome the challenges that come with going on the path to parliamentary democracy and constitutional law and rule. We will of course be guided by the Fijian Government as to what they seek from Australia. We will of course be guided by what it is they believe we can offer. I don’t presume to lecture any other country about how they run their affairs but I can offer the experience Australians have had in terms of parliamentary democracy. It is essential that oppositions and politicians have the freedom to hold the government to account. It is essential that an independent judiciary exists to adjudicate disputes and to interpret the law. A free and unfettered media might be a complete pain in the neck for politicians but it is essential to hold all the sides of politics to account on behalf of the people. Political stability is what business and investors seek. The issue of sovereign risk is bad for any country and political stability is absolutely essential. These fundamentals have been the experience of Australia and a number of other countries, including countries committed to the Commonwealth of Nations, over many years and I believe that these fundamentals can be achieved by Fiji with the support of its friends. Australia should never and will never if I have anything to do with it, forsake Fiji. Ladies and gentlemen, foreign policy under a Coalition Government will be marked by an unmistakeable focus on our region. I come from Western Australia, so the Indian Ocean is part of our region, of course here in Brisbane the Asia-Pacific is part of our region. So for Australia our region is the Indian Ocean, Asia Pacific. This is our neighbourhood. This is where we need to focus our attention as a government. Under a Coalition Government all of our foreign policy assets, whether they be military and defence capabilities, or economic and trade capacity or diplomatic and foreign aid activity, will be focussed, not exclusively, but unmistakeably, in our region. Let me take trade policy for example. The Coalition will describe our foreign and trade policy an exercise in ‘economic diplomacy’. We will align all of our agencies and all of our departments across government in pursuit of our strategic goals through economic diplomacy. In the area of trade that means we commit to a network of bilateral and free trade agreements to liberalise trade in our region. I know of no better way of lifting countries out of poverty than through economic liberalisation through trade and through private sector investment and that is what we will encourage, country by country. In particular I’m concerned that the PACER Plus negotiations seem not to have advanced and in fact have stalled. I think that the PACER Plus negotiations need fresh thinking, a new start. What may be required is for some of the bigger economies in the region, namely Australia, New Zealand, Fiji, PNG to conclude bilateral or, if we could do it quadrilateral, free trade agreements, a high quality agreement that would bind us together and that other countries in the Pacific can then see the benefit of a free trade agreement and can opt in to such an agreement. They would then have the ownership of the reform process that will be needed. They would have ownership of the pace at which they would join such an agreement. Instead of standing still and leaving PACER Plus to languish I believe it needs an injection and the major economies, including Fiji, must be at the forefront of ensuring that trade liberalisation can continue in the Pacific. Under a Coalition Government, we will continue to provide overseas development assistance into the Pacific. I acknowledge and recognise that Australia is the largest provider of aid to Fiji and to a number of other island nations in the Pacific but as a Liberal I believe in a hand up, not a hand out and I believe that’s what the countries in the Pacific are looking for as well. Through trade liberalisation, through opening our markets, through private sector investment in development, we can turn developing countries into developed countries. Our philosophical belief in individual enterprise and in the private sector I think will have much longer term ramifications than even free trade agreements. Back in the 1950s, Prime Minister Robert Menzies signed Australia up to what was called the Colombo Plan and through this process thousands of young students from the Asia Pacific came to Australia to study in our universities. Over a 30 year period, the 1950s to 1980s, 40,000 young people from the region studied in Australian universities, lived with Australian families, got to know the Australian way of life and they went back to their country and today they are Prime Ministers, former Prime Ministers, Cabinet Ministers, business leaders, community leaders in those countries and they have fond memories of Australia and their experience in Australia. We believe that it’s time to reverse the Colombo Plan and we’ve announced a signature initiative dubbed the ‘New Colombo Plan’, that will see young Australians given the opportunity to study at universities in the region. We want to see it as a ‘rite of passage’ for undergraduates in Australian universities to have the opportunity under a nationally backed scheme, to undertake part of their bachelor course at a university in the region. What we hope will happen is countries will opt-in to our New Colombo Plan. When their universities, or their higher education sector are ready to accept Australian students in large numbers, we will come to an arrangement with that country. There are lots of issues about student visas, and course accreditation and mutual recognition of capacity but over time we hope that all countries in the region will want to be part of the New Colombo Plan. How we’ll make it attractive to young Australians to study at universities in the region is a business partnership that we propose with businesses operating in the host country. For example, a student at Queensland University, wins a New Colombo Plan scholarship to study at the Fijian National University in engineering then say Newcrest operating in Fiji could offer them an internship, one or two days a week for the duration of the scholarship. Or more pertinently, a student studying finance in Fiji could get a job for the ANZ Bank and I’m delighted to confirm that the ANZ Bank has agreed to come on board, should we win government, to be a supporter of the New Colombo Plan, throughout the Asia Pacific. Thank you Mark. So can you imagine, just dare to dream of an Australia where thousands and thousands of young people have lived and studied and worked in a country in our region. Learnt the language, understood the culture, got to know the people, formed friendships that will no doubt last for life and come back to Australia, with their new skills, new perspectives, new insights and new ideas. Not only will they be contributing to the productivity and prosperity of our nation, they will be part of a deeper and broader and more diversified engagement with countries in our region. I hope that I’ve given you some indication this evening of how a Coalition Government would seek to engage, not only with Fiji, but with our region, the Pacific, in Asia, and the Indian Ocean. I want to pay tribute to the Australia-Fiji Business Council and its counterparts in Fiji for arranging this event. I think it’s a real milestone. I hope that when you leave, after this forum is over, you will go away firm in the knowledge, as I truly believe, that the best days of the Australia-Fiji relationship lie ahead of us. Professor Brij Lal stuck in a time warp? Can’t wait to hear what ‘Professor’ Brij Lal has to say. Australian politicians are starting to see through his simplistic, unhelpful analysis. They are listening to Inoke Kubuabola, or to his speech-writer, not to Brij Lal. What an ignominy for a so-called analyst! Historian Brij Lal spends too much time in archives and libraries, and not enough time in the sunshine. Some of the dust seems to have gotten to his brains. Boxers get punch drunk, historians get stuck in a time warp. Brij Lal is totally bereft of new ideas or constructive analysis, which is what we all need instead of the same old waffle emanating from his mouth. And what about Brij Lal’s lapdogs, John Baledrokadroka & Tevita Mara? The former writes a PhD thesis (supervised by Brij Lal) on the basis of secondary evidence gained from being cloistered for four years in a library in Canberra!!!! What are his primary references? Has he been to Fiji to conduct research and obtain primary data to support his mistaken thesis about the so-called ‘unintended consequences’ of Fiji’s UN experience? What a lot of BS! As for Mara in Tonga, well he is now, like Baledrokadroka in Oz, jobless and living on the dole! Great speech by Julie Bishop. We do need a new government in Australia. I believe that Julie’s speech is a fair reflection of the views of the Australian public on Fiji. The card has been on the table for a number of years now for the Australian Government to change their stance on Fiji yet they havent. Bigger countries like the USA and the likes are beginning to understand the situation in Fiji and are beginning to re-position themselves in anticipation of the general elections in 2014. Believe me if it wasn’t for Australia’s continued insistence on maintaining current sanctions against Fiji, things would be totally different now. All this big countries are willing to step in and assist Fiji restore parliamentary democracy however their reluctance stems out of the fear that Australia might view it as a move to discredit their authority (loss of confidence on Australian Govt to handle things in its so called circle of power). Good on you Julie, way to go. Another great and constructive speech from the most underrated person in Australian politics, much easier on the ears, the brain and the eyes than strident feminists like Gillard and the majority of other Labor female politicians. The New Colombo is brilliant and typical of constructive pragmatic thinking that brings identifiable results in comparison to empty rhetoric. Julie would actually make a hugely successful Australian PM, and even if she never gets there she will do far more for constructive and positive feminism as Deputy PM, than all the strident Labor females put together. The speech is also pleasing to me and timely because just two days ago I wrote on this blog asking people in Fiji to direct their anger at the current Government not the average Australian, and Julie has verified my statements plus held out the wonderful prospect of not having to direct anger anywhere if Australia has a change of Government. Make no mistake Australia, and by definition the whole Pacific area, is at a watershed moment with this forthcoming Australian election. As the astute afro American economist, social theorist, political philosopher and author Thomas Sowell recently said “We have been replacing things that work, with words that sound good” and that applies just as much to Australia over the last 6 years as it does to USA and Europe, and no more vivid example than the current Government who disbanded a successful boat people policy and now have floated a new policy that has more holes in it than those boats, and is a recipe for huge dislocation in the Melanesian and Pacific world, as Fiji to its credit has immediately recognised. An Australia back on track will mean a Pacific back on track, so those of you with Fiji connections eligible to vote in Australia will have two reasons to vote for Julie and her party – you will be helping both the countries you love, Australia and Fiji. A real great speech that brings hope. A powerful vision of the future I’d really love to live in. Oh dear me – if only there were more respectable and visionary people of Julie’s caliber – what a region this will be. The problem in Fiji isn’t the army, yes they’ve been responsible for the coups but lets be honest Fiji’s problems is one of racial tension and traditionalists views. After independence we jumped straight into democracy without really thinking about it. On the one hand we have a traditional form of governance that is the chiefly and tribal system therefore trying to enforce democracy where citizens are meant to think and vote independently is a monumental task. Both of these set of governance contradicts each other in most aspects. Now you add our Fijian citizens of Indian heritage to the mix plus religion then we start to get a picture of a country that really needs to address itself. When you look at our issues and think about solutions, one in particular pops into mind and that is there’s basically no possible solution to make everyone happy. There will always be a group or party that will feel hard done by. So out of all the possible solution you try and pick the least destructive and probably most popular. Basically we need to reconstruct a way of governance from the very ground foundation and up. Bearing in mind it won’t be a complete one but it will be a start and as years pass we can add or delete things as we go. We cannot and should not try and emulate the western or eastern form of governance but instead we can learn from both and try and build a Fijian style democracy customised to our resource, economy, needs, religions, traditions, strength and most importantly to our reality. No so called democratic government has ever tried to address our issues, they probably thought it was too complicated and time consuming especially in political terms, when you take into account the short term of political office you can sort of understand. So now when you think about it although its very un-western democratic, the coup was our best option, even probably our last hope of ever addressing our issues. All of the traits of western democracy about human rights are fine but as a whole our countries issues were more important. In order to participate as a international member who respects human rights our countries issues is vital which needs our immediate attention. Australia went through the aborigines shoot on site policy phase before getting to where they are today, US had similar process in regards to red Indians and slaves, UK with Indians and slaves too. Fiji needs to stop trying to jump steps. We need to go through our own process in order to achieve inclusion for all citizens. We just can’t merely take a short cut for our history have shown that if we do we’re bound to repeat it. For now regardless of how they came into power we need to support our government. All these bickering and whinging will only either delay or worse repeat our issues rather then being actually addressed. We can go on and on about our land, inheritance etc etc. one thing we can’t change is reality. Our Fijian of Indian heritage and other races are here now. How many more generation before we accept them. The question has always been how are we gonna deal with it and I for one am grateful that at least the foundation has been laid. It may not have been through the best of circumstances but hey it’s a start and its not set n stones, there’s always opportunity in the future to add or remove various policy and laws. Lets not forget the freedom of those western countries were attained through guns, perhaps our liberation can have the same song. AUSTRALIAN public servants can learn nothing from Fiji’s bureaucracy, says a Fijian academic expelled from the country and now based in Canberra. Foreign Minister Julie Bishop’s meeting a fortnight ago to repair relations with the country ruled by Commodore Frank Bainimarama included a low-key public servant exchange program between the two nations. But, said Australian National University’s Professor Brij Lal, Canberra bureaucrats will learn nothing in Suva where the heads of departments are military men. ”Their presence at the top stifles process,” Professor Lal said. ”They’re not accountable to the public service commission but report straight to the commodore. ”If you write to any civil servant asking them for an answer, you won’t get an answer. Everyone is scared of putting an answer down on paper – it’s the fear factor. In 2009 Fiji expelled Australia’s top public servant in the country, high commissioner James Batley. Fijian-born Professor Lal – now an Australian citizen – was expelled from his country after criticising the decision. Fiji last year refused entry to Australia’s proposed high commissioner, Margaret Twomey. The Department of Foreign Affairs says Fiji’s economy and living standards have been affected by the 2006 coup, particularly because regime supporters and military leaders have been appointed to boards. Since the coup, Fiji’s economy has been stagnant with an annual growth rate of just 0.7 per cent. This compares with 2.5 per cent growth in the years preceding the coup. @Brij ‘the babbler’ Lal, hahaha, there is no substance in the article. Must have been a slow day for the Canberra press. Who to turn to on such days but desperate media tarts like professor Brij Lal who will open toilet doors to get their name and picture in the Australian press. check out 2000 coup video to see who was supporting coup. Australia is haven for coup supporters like Simione kaitani and Ted young. Good to see that some people have begun to catch on to the ubiquitous Brij Lal. In my book Brij is “a man for all seasons and a face for every occasion.” No to be trusted. I warned long ago–as long ago as December 2006– that Brij was not to be trusted. The Bainimarama government was completely right in throwing Brij out of Fiji when it finally did. 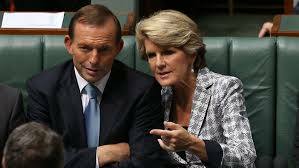 As for Julie Bishop’s recent statement: nice words, we’ll have to see what comes of them. I worked as an insider for the Labor Government in the Whitlam years. I had a TOP SECURITY clearance for the Private Secretary position I held (incidentally for a West Australian Labor Senator) so I know a thing or two about how Australian government works. Julie Bishop and the ALP might have some nice words to offer partly because they make good copy. Fiji’s new government has to be careful in whatever turns out to be its new relationship with Australia–careful and smart and armed to the teeth to do the diplomatic work that will eventually have to be done on the back channels. And Fiji should keep in mind Lord Plamerston’s dictum of may years ago: Diplomacy is not about making friends or creating enemies. Diplomacy is about protecting interests. Fiji needs to protect its interests keeping in that Australia has interest also but that Australia’s interests do not necessarily dovetail with Fiji’s.